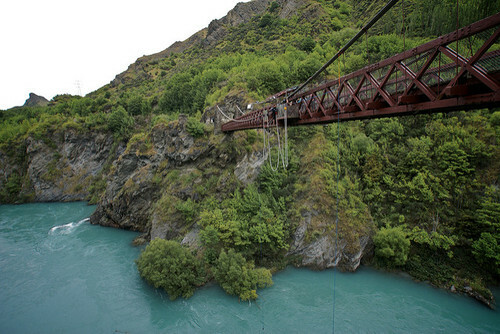 New Zealand's the land of stunning natural beauty, action-packed activities & laid back culture. Kick off this trip in the land of "The Lord of the Rings", Wellington. Take in a dinner sunset cruise on Lake Taupo and brave the Rock'n Ropes course. In Rotorua try the 'Zorb' or skyline gondola & end the day relaxing in a Polynesian thermal pool. Black water raft the underground caves of Waitomo & in the Bay of Islands go sand dune surfing. Finally, the good times must come to an end in the country's biggest city, Auckland. 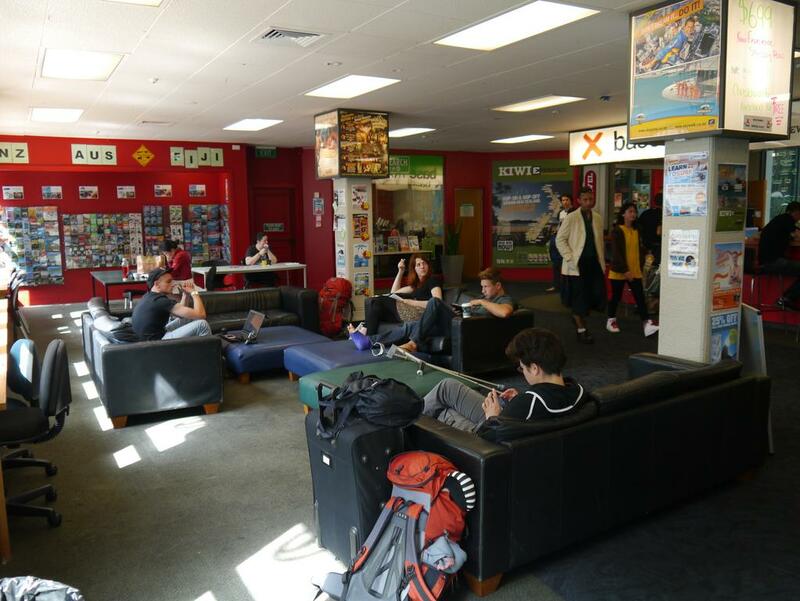 Check into the Abel Tasman Hotel, then the rest of the afternoon is free for you to explore. Meet your fellow travelers & Tour Manager this evening. Spot the dramatic volcanic landscapes today that were used as backdrops in "The Lord of the Rings", when we drive past World Heritage-listed Tongariro National Park. The park is also home to the still active volcano, Mt. Ruapehu, which doubles as NZ’s biggest ski field. Continue on to the popular low-key resort town of Taupo. Here, there’s some of the best trout fishing in the country and some of the most amazing long-distance views of Tongariro National Park’s three volcanic peaks. Cap off your day with our optional dinner cruise out on New Zealand’s largest lake – Lake Taupo - where you can have a go at fishing! Later, back on land, play some pool at one of Taupo’s lakeside bars. On the way out of Taupo, a visit to the raging Huka Falls will impress. Tonnes of water surge over these falls at a rate of 220,000 litres (58 000 gallons) per second. It’s a short drive to Rotorua, famous for its spurting geysers, boiling mud pools, hot springs and ‘interesting’ sulphur smell. For some crazy ‘Kiwi ingenuity’, try an optional called zorbing. It’s an activity where you get inside a huge plastic ball and roll down a 200m hill, either by yourself or with a friend. Rotorua is an important hub of Maori culture. To recognise this, we have an optional authentic cultural experience, complete with a fantastic Maori hangi and traditional dance concert. Some of the foods you can try from the hangi are sweet potato and chicken cooked on hot rocks in an underground pit - just as they have been for centuries. Listen to stories, songs and chants while learning about ancient Maori mythology and beliefs. This morning, we stop at the Agrodome farm show for an interactive introduction into farming and agriculture, which is New Zealand’s main industry. You’ll see sheep-shearing and watch an impressive sheepdog demo. These dogs are highly-trained and skilled at controlling livestock. 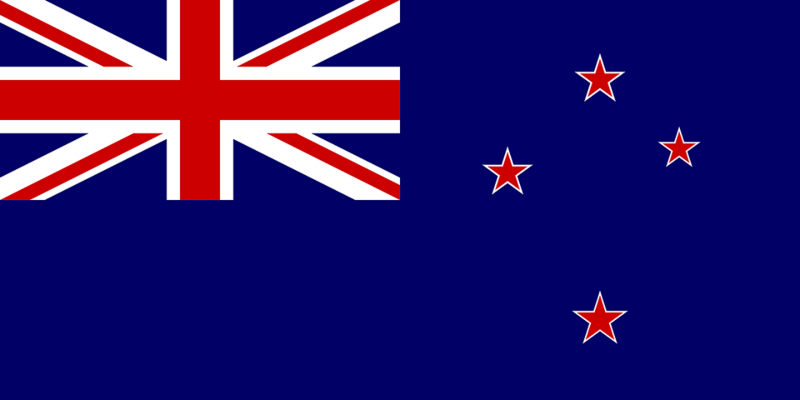 We'll stop off for an included visit at Otorohanga's Kiwi House to check out New Zealand's national bird. This shy creature only comes out at night - the nocturnal enclosures at the Kiwi House mean you're guaranteed to see one. If you're lucky you'll also get to spot a tuatara - a true 'living fossil' reptile that pre-dates the dinosaurs! Next up is Waitomo and the Waitomo Caves. Famous for their incredible limestone formations and glowworms, the caves are a stunning subterranean world. You’ll see the Glowworm Grotto, where the cave roof is covered with twinkling insects. For adventure, you can head deeper into the caves in an optional activity and see them either on foot or by tubing down an underground river. Tonight, it’s traditional Kiwi BBQ dinner and a visit to a typical country pub. Kick back with your new friends and some of the locals. Maybe try out the local beer – it’s good! Today we drive through the lush farmlands of Waikato – an area that produces many of New Zealand’s best rugby players for the All Blacks - before arriving in Auckland. As New Zealand’s largest and most cosmopolitan city, Auckland is surrounded by volcanoes, islands and a stunning harbour. You’ll soon understand why this is the "City of Sails" and was once home to the America’s Cup. 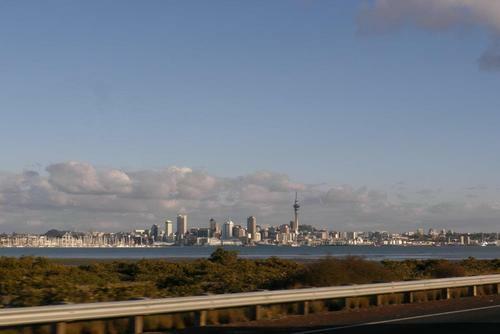 Here we'll show you the city spots on an included sightseeing tour before heading up the iconic Sky Tower. A VIP pass at one of our favourite nightspots awaits tonight. This morning we’ll cross the iconic Auckland Harbour Bridge. 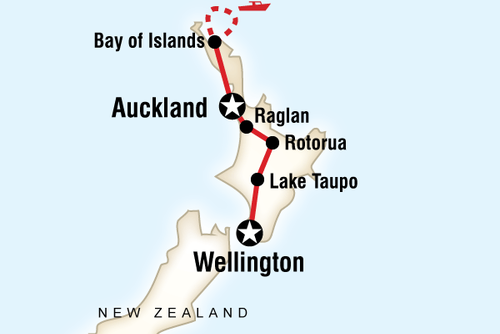 There are full-blown vistas of the harbour, Rangitoto, and other neighbouring volcanic islands on the way. With a stop at Parry Kauri Park, there’s time to walk through this famous reserve and see many of New Zealand’s ancient Kauri (a native tree). Some of the Kauri are 50m high and over 1000 years old. The final stop today is the small coastal town of Paihia. It’s the gateway to the Bay of Islands, one of New Zealand’s photogenic natural playgrounds. Your Tour Manager will point out the colonial style Treaty House at Waitangi. This is where modern-era New Zealand was born when the British Crown and Maori signed a treaty in 1840. You’ll also find out about local Maori culture as you check out the Nga Puhi tribal lands. Tonight you'll get to experience a typical ‘Kiwi’ dinner – fish 'n' chips – where you can eat outdoors under the night sky if the weather is good. After dinner, head out to a local music venue in Paihia with the group. With a full free day here, you’ll really get to enjoy the laid-back, natural beauty of the Bay of Islands. Chill out, or choose from loads of activities on offer here. There’s a catamaran cruise where you can stop off at remote islands, swim and feast on a tasty BBQ lunch. 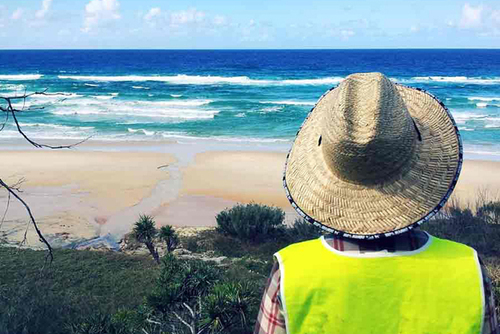 If you’re lucky, you’ll even spot some dolphins. 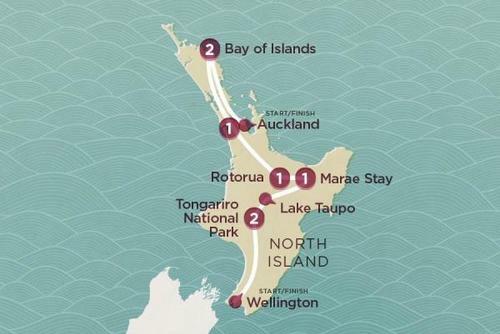 Or you could use your free time to head off with some friends to learn about New Zealand’s settler history. 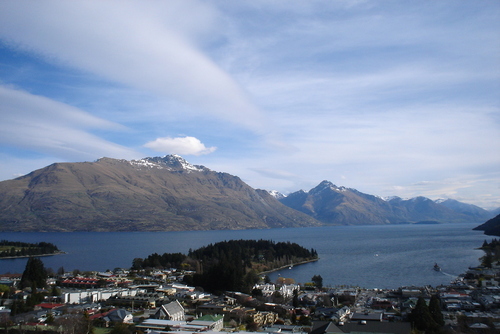 Jump on a ferry out to New Zealand’s former capital, the pretty township of Russell. Grab an ice-cream, relax in its cute cafés and walk past some of the town’s historic cottages. 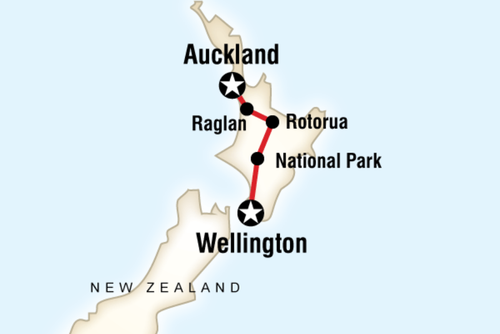 We also offer you the option of a day trip to Cape Reinga, New Zealand’s most northern point where the Tasman Sea and Pacific Ocean merge. Our Local Guide can tell you all about the Maori beliefs associated with this site. 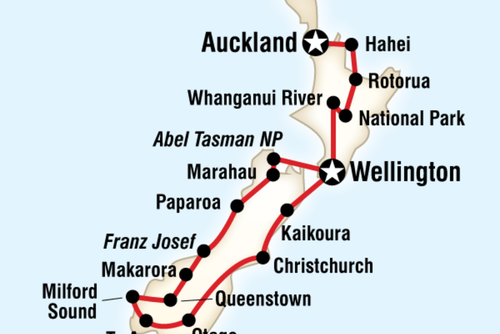 Then it’s off to the sand dunes of Ninety Mile beach and a drive through the Northland Region. Lastly, for the adrenaline-junkies, there’s a chance to go parasailing – perfect for getting views of the awesome surrounding bay scenery. It's your final night together on tour, so make it an evening to remember! 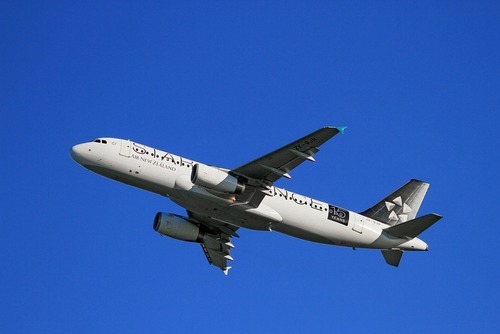 Head back south to Auckland today, where your tour winds up in the city centre mid-afternoon.